The staging for Savior of the World should be kept simple so that the sacred story of the Savior can be presented without distraction. Thus, Savior of the World can be adapted to available resources and still meet the needs of the production. Scenes flow seamlessly from one to another with minimal changes in staging. Except for the opening and closing of acts, the stage curtain is never drawn, and blackouts occur only at the five instances marked in the script. Actors can make all setting changes within each act by carrying props and moving set elements as part of their action. The description of the original set included below may assist directors and designers in understanding the intent and spirit of the original production. However, any set with multiple levels and easy stage access for the performers can provide the flexible space needed for the production. Limited resources should not be viewed as limiting creativity. 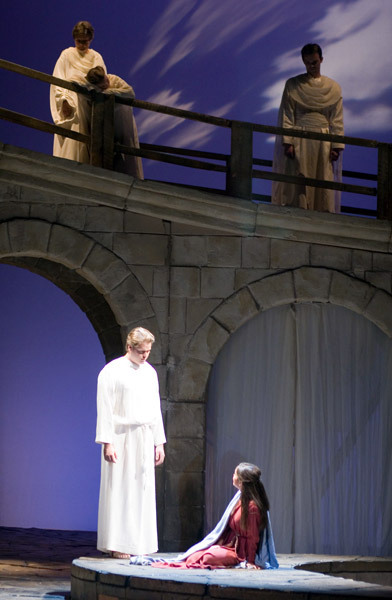 The spiritual message of Savior of the World is conveyed through the testimonies of the performers without the need for elaborate scenery or sets. 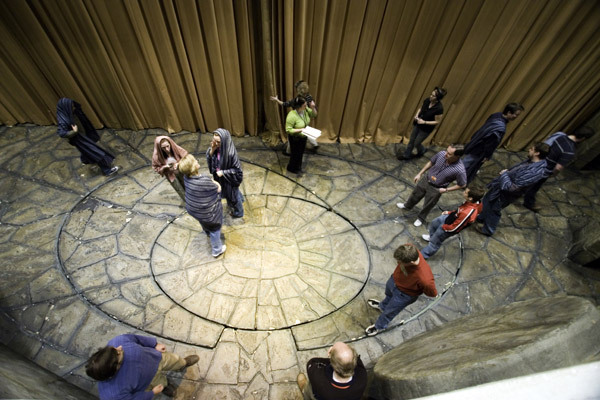 The original set for Savior of the World consisted of a semicircular stone colonnade with a railed balcony and an oval-shaped, mosaic-like stone floor. The colonnade represents the heavens and provides visual and spatial distinction between the heavens and the earth. Atop the colonnade, prophets view the action on the stage floor as if in vision and speak familiar scriptural prophecies. Descending from the colonnade, angels visit the earth to deliver heavenly messages. And in almost every scene, chorus members as angelic hosts gather on the colonnade to witness the events below as a poignant reminder of heaven’s interest in the lives of all God’s children. The colonnade needs to be a raised area large enough for the entire Chorus. It also needs to have easy access to the stage for angelic messengers, as well as offstage access for chorus members to enter and exit without being seen. In the Conference Center production, this was accomplished by offstage stairwells downstage left and right that led up to the walkway atop the colonnade. The walkway was about six feet wide with rails on both sides. The walkway was supported by arched portals upstage and downstage, creating a covered breezeway surrounding the open stage floor. For angelic visitations from the colonnade, two descending ladders were built into the floor of the walkway. These ladders were lowered only as needed and raised after the angel(s) returned to the colonnade. The use of specific portals created different settings for the action of the play. The same portal could represent multiple settings depending on how it was filled. In act one Zacharias and Elisabeth’s house was represented by a small bench stage right and a curtain drawn across a specific downstage portal. Similarly, Mary’s house was represented by another curtain in a different downstage portal. Veils drawn across portals also camouflaged the ladders by which angelic messengers descended from the colonnade. 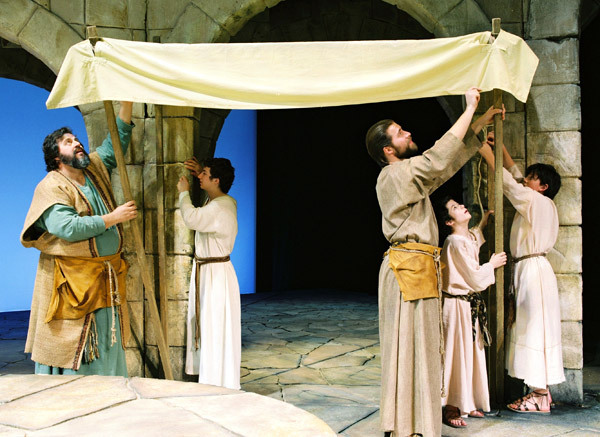 In act one, scene 2.1, the canopy representing Joseph’s house was lashed together and secured to the front of a portal (see picture). 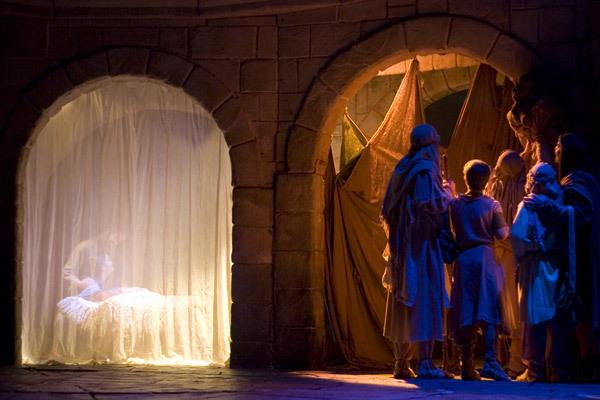 In act one, scene 3.5, curtains represented the houses in Bethlehem and the stable door, which was represented by the most ragged curtain. As the shepherds boost Nathan to look inside the stable, light behind a sheer curtain in the adjacent portal revealed Mary and Joseph with the baby and manger, as described by Nathan (see picture). 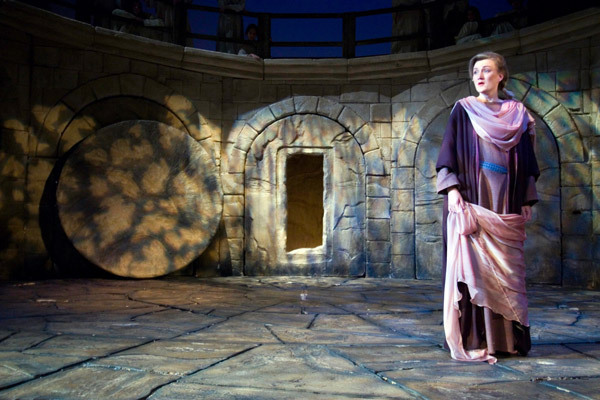 In the second act, stone plugs in multiple portals represented the Savior’s tomb. The center plug included a doorway through which Peter and John exit the tomb. Angels who roll the stone away enter this doorway and then exit the stage. The upstage portal behind the tomb opening was also plugged. In addition, a gate depicting the garden entrance was hung in the downstage portal stage left of the tomb plugs. These plugs and the gate were later removed at the end of act two, scene 1.3. As the scene transitions to the upper room just before act two, scene 2.3, wooden doors in the upstage portals were used to represent the upper room. The action of the play takes place on the stage floor. In the Conference Center production, the stage floor was equipped with multiple elevator lifts in the pattern shown (see picture). In the first act, the outer lifts were raised to represent Mary’s home and Joseph’s house on opposite sides of the stage. The lifts were also used to create the shepherds’ hill outside Bethlehem. The center elliptical lift was hinged in the middle, and the hinged section was flipped up to create the diagonal slope of the hill. In the second act, the outer lifts were dropped to create the Sea of Galilee as the Apostles fished from the center lift. Later the center lift was raised to its full height with the other lifts forming a stair-like pattern around it to create the Mount of Olives climbed by the Apostles and Chorus in the finale (see picture). Instead of traditional scenery, the backdrop was created by lighting. At the opening of the production, an expanse of deep blue sky and bright stars was projected above the colonnade. 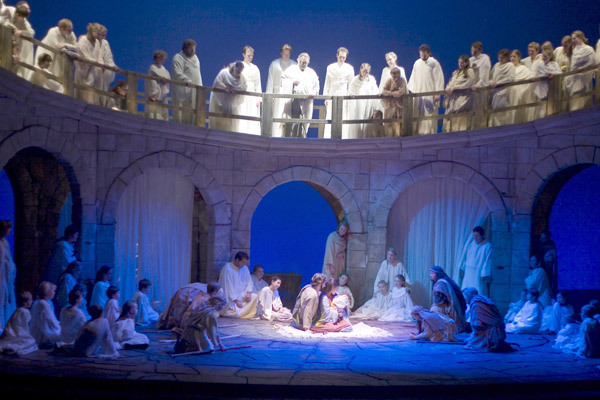 As the play progressed, lighting changes suggested the rising and setting of the sun with clouds moving across the horizon and the expanse of the night sky including the star seen by the shepherds. 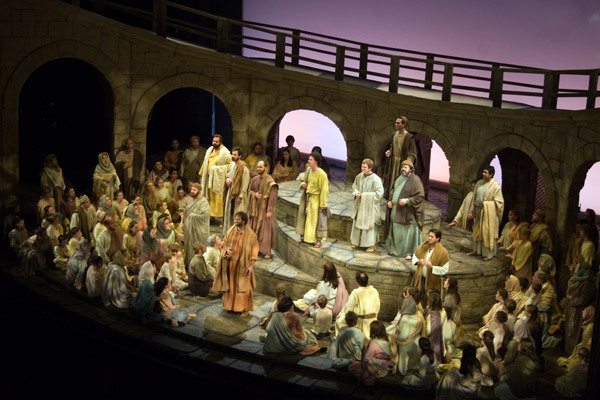 Savior of the World can easily be adapted to a variety of facilities, including stake and ward buildings and community, school, or professional theaters. Choices regarding set design will depend primarily on the choice of performance location. The suggestions given below may assist in creating a simple set. The colonnade can be represented by platforms at the back of the stage. Or the stage itself may serve as the colonnade with a lower thrust stage in front of the main stage serving as the stage floor. Or a combination of platforms on stage and a thrust stage in front can create additional levels that may help to bring tighter focus to intimate scenes. For buildings that do not have a stage, portable staging can be used (see set examples 1 and 2). Savior of the World might also be adapted for a theater-in-the-round production. The center of the room with various levels of portable staging could serve as the main staging area, while risers surrounding the stage could serve for seating (see set example 3). Other areas off-center of the main staging area could serve as auxiliary stages for angels, prophets, and other messengers.